The idea of the fragmented city and the negotiation of space in the public domain is an activity that fits well with my current investigations of territory, seed conservation, and ecological commerce. Civic spaces typically promote activities that emphasize the collective drive towards financial security, competitive trade, and remuneration of goods and services. Within the subtle infrastructure of this activity is a complex fabric of free-range exchange that ideally involves the bridging of cultural and ecological islands within a community. How might one bring to the forefront the delicate nature of this fragmented fabric and in turn retrofit the blanket of human consumption with practices of common grazing that are sustainable and grounded in diversity? The expanse of an installed crocheted canopy or hand-knotted net might allow an urban dweller to experience the same topographical vastness or limitless view or catch that a wilderness explorer or deep-sea fisherman might. A hovering, migratory fabric might also shelter us from extreme environmental elements and provide cover or roofing for air loft gardening or seed harvesting. The inevitable cloak of globalization demands that we examine the fringes of zoning, resource management, the changing atmosphere, and quilted urban layers in order to resift our attitudes about survival, spatial utilization, and shared surfaces. I am specifically interested in using seeds, textiles, and (biodegradable) fiber in conjunction with gardening and civic planning as an opportunity to reorder our consumption practices. I want to better understand how one person’s plot, cultivated civic identity, and connection to seed banking and dissemination might strengthen a weakened social fabric. 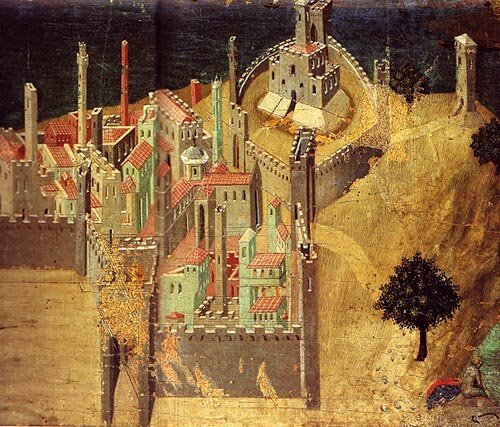 Comune, in Italian, refers to a self-governing community, not necessarily in the utopian, isolationist sense of the word, but as a model for wresting power from outside influences to create il buon governo, a mosaic-like garden of civic connectivity. It is this pixilated bricolage of social and ecological zones that makes a community vibrant on multiple levels. A reinvigoration of agrarian practices within the urban arena allows for canopies of new surfaces and individual islands of exposed layers on which we can collectively graft our hopes.